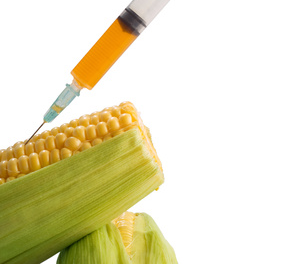 Fructose as an injectable Dieting Aid? Sounds crazy, but it works! 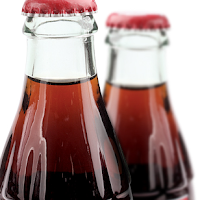 Would you ever have remotely considered that a high-fructose corn-syrup based sugar-sweetened beverage could help seven health obese women who are 35%-90% over their ideal weight lose weight? No, ...? Bad Fructose not so Bad, After All! Learn its Benefits. Americans Don't Eat More Fructose These Days! Before we are pondering the results, let's first have a closer look at the actual design of a study was conducted to "examine the influence of low-dose fructose infusion on nitrogen economy and the metabolic response to fasting in man" (Gelfand. 1986 | I know that you should do that in "man", not rodents, but that's costly and has the aforementioned limitations). In all subjects, fructose was administered by continuous intravenous infusion of a 10% solution in water (American McGaw), delivering 100 g of fructose (375 kcal) per day. As you can see in Figure 1 the first thing the fructose did was to keep the blood sugar and insulin stable and the levels of the active thyroid hormone T3 (iodothyronine) from plummeting. In addition, the levels of the glycogen liberating hunger hormone glucagon remained stable over the course of the whole study period in the fructose arm(s) of the study, while it increased by more than 80% in the women who didn't receive the fructose infusion. Hormonal changes and real world effects! Now hormonal changes are one thing. Real world effects which cannot always be predicted solely by endocrine parameters are yet often a whole different animal. What you would maybe have expected, though, is the decrease in ketone production during the supplement phases, which are indicative of "less starvation" (Blood beta-hydroxybutyrate is only a sign positive ketosis, when you actually eat tons of fat, not when you fast - in that case they are a starvation response; see Table 1)? What you probably also expected are are the decreases in bicarbonate and increases in uric acid, of which the latter have previously been reported to contribute to the metabolic derangements that occur with high fructose intakes on top of an already obesogenic diet (Sahebjami. 1971; Nakagawa. 2006). Did you know that the addition of sodium bicarbonate or a combination of potassium bicarbonate and calcium carbonate can "buffer" the increased acidity that occurs on very low energy diets and minimize the urinary nitrogen loss in form of ammonia (see Figure 2)? No, well... I guess it's about time you learn more about sodium bicarbonate, then ;-) It can, for example, also buffer the reduction in growth hormone production that occurs, when the acid level in your body is rising (see Figure 3 in previous article). Plus: It's obviously a neat ergogenic. What is way more important than the previously described changes in serum parameters is the effect the infusion of fructose had on the energy expenditure, of which all of you know that it plummets, when you starve yourself. An effect that has long been touted as the main "risk factor for body-weight gain" (Ravussin. 1988) and thus unsuccessful dieting by scientists. One of the factors that contributes to the "reduced rate of energy expenditure" is the the previously mentioned decline in thyroid hormone levels, of which you've just learned that it can be ameliorated by fructose injections (see Figure 1). Another one that is partly related to the decline in T3 is the loss of muscle mass - a process of which Byerley et al. (1996) argue showed that it does not have the protein sparing effects many people believe it would have. 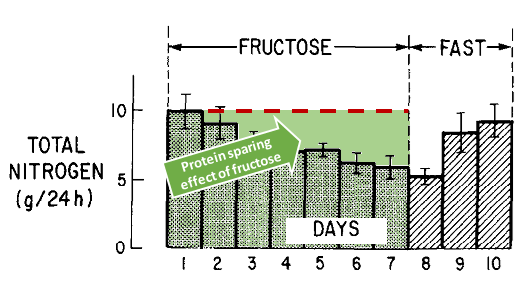 Figure 3: Fructose decreases the total urinary nitrogen loss by ~40% (Gelfand. 1986). In view of the results of Byerley & Heber's human study that investigated the metabolic effects of triiodothyronine replacement during fasting in obese subjects and found no effects when the protein intake was >70g/day (or 50g were complemented by 76g carbohydrates), it is thus much less surprising that the provision of fructose increased the triiodothyronine levels and decreased theh net urinary protein loss. A brief look at the serum amino acid levels of the subjects (not shown in Figure 3) suggests that fructose may have had a BCAA sparing effect, as well. Bad Fructose? Increased Glycogen Synthesis, Reduced Glycemia, Higher Glucose Oxidation - When Do These Beneficial Effects Occur? And Why Don't They Prevail? | Read more! Bottom line: Overall, it is unquestionably remarkable how effectively less than 375kcal of energy from fructose can reverse major components of the starvation response in human beings, i.e. abolishes the entire hormone-substrate response (specifically the decline in T3), spare body protein, and reduce urinary mineral (specifically sodium) loss. Unfortunately, one very important question remains: What will happen if the fructose has to pass by the liver first, i.e. if it is ingested orally, not injected? The absence of corresponding research and the question, whether the same effects will be observed if small amounts of fructose are added to a saner form of "crash dieting", e.g. a protein modified fast, make the results of the study at hand interesting, but difficult to interpret. Byerley, L. O., and D. Heber. 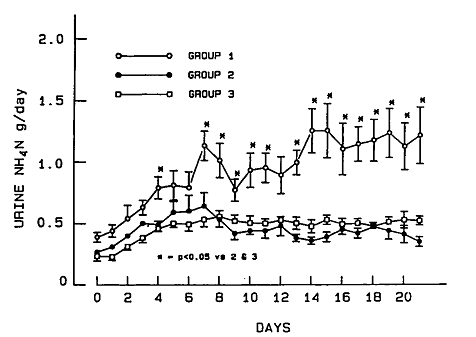 "Metabolic effects of triiodothyronine replacement during fasting in obese subjects." The Journal of Clinical Endocrinology & Metabolism 81.3 (1996): 968-976. Gelfand, Robert A., and Robert S. Sherwin. "Nitrogen conservation in starvation revisited: Protein sparing with intravenous fructose." Metabolism 35.1 (1986): 37-44. Gougeon-Reyburn, Réjeanne, François Larivière, And Errol B. Marliss. "Effects Of Bicarbonate Supplementation On Urinary Mineral Excretion During Very Low Energy Diets." The American Journal Of The Medical Sciences 302.2 (1991): 67-74. Nakagawa, Takahiko, et al. "A causal role for uric acid in fructose-induced metabolic syndrome." American Journal of Physiology-Renal Physiology 290.3 (2006): F625-F631. Ravussin, Eric, et al. 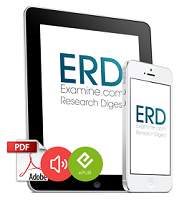 "Reduced rate of energy expenditure as a risk factor for body-weight gain." New England Journal of Medicine 318.8 (1988): 467-472. Sahebjami, Hamid, and Raymond Scalettar. "Effects of fructose infusion on lactate and uric acid metabolism." The Lancet 297.7695 (1971): 366-369.